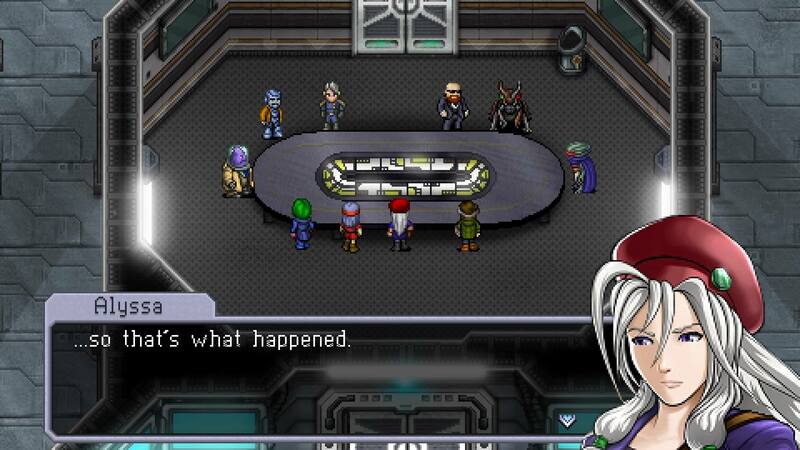 Cosmic Star Heroine features one of the worst stories you will ever see in an RPG. It is bad to the point of exasperation. The good news is that almost everything else about the game is excellent! But the bads are so bad that they become a burden from which the game can never fully crawl out. Like a high schooler’s notebook, the game is full of imagination–and also full of half-baked nonsense. There really aren’t enough Eastern-influenced science fiction RPGs; Phantasy Star IV is still one of the best, and it came out in 1995. 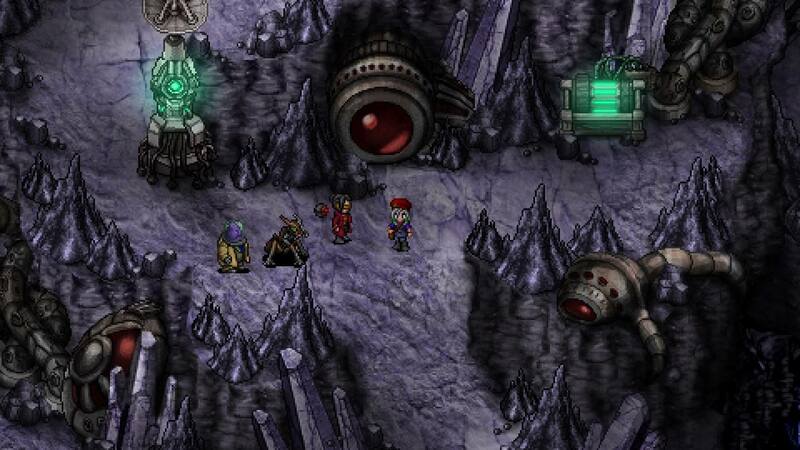 Cosmic Star Heroine is a badly needed new sci-fi RPG, and on paper, it does a lot of things right. For instance, the game is bursting with creativity: You accumulate a wealth of unique party members, from detective ghosts to cyborg insects. 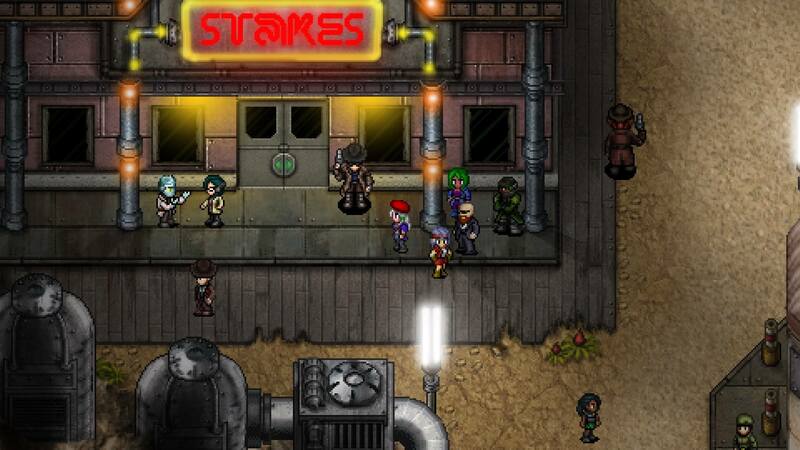 You travel to a “Wild West” town located underneath the surface of a dangerous planet. You generally find many varied locations with distinct visual themes. And all the 2D environments are very well rendered too, in a gritty science-fiction style. Not so often did the developer resort to just plastering redundant tiles to create dungeons and call it a day. Rather, the environments look very “organic,” including a vast multitude of one-off graphics that must have been really laborious to produce. The amount of effort that went into this game’s visuals is extremely commendable. The same can be said of the soundtrack. I was consistently bewildered at just how unexpectedly great the music to the whole game is. A wide variety of different sounds are used in songs according to location and context. The music always does a great job of capturing the mood–or, more specifically, of creating a mood, since the story is too insufferably bland to set a mood by itself. Character portraits always look like something lifted off of DeviantArt. They never look as good as the sprite work. Another thing that really bogs the narrative down is the abundance of hand-drawn cinematics in the game. Why would cinematics be a bad thing? Well, in this case, they are all unattractive, poorly animated, and incurably boring. They are just not visually interesting at all, and they come across as cheesy instead of exciting. The developer would have been better off depicting its big moments all in-game, since that was clearly the game’s artistic strong suit, instead of resorting to these cinematics that look like they came out of an MS-DOS game. The good news is that the game ends after only 15-20 hours, short enough that you won’t lose your mind. There are lots of uniquely satisfying party combinations to try out. 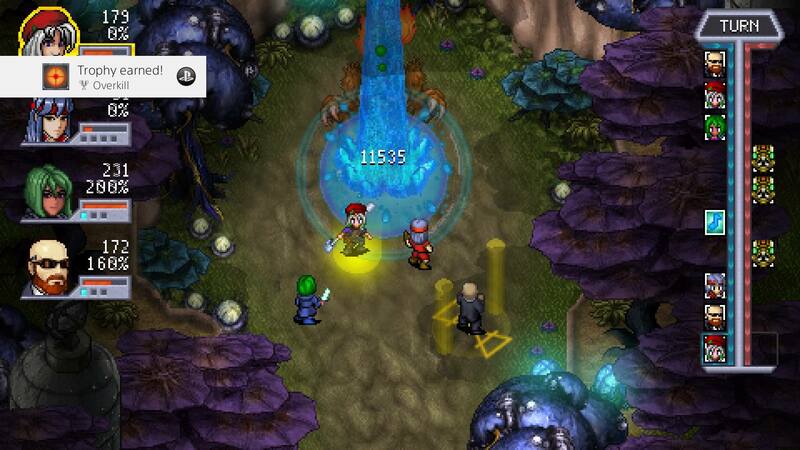 The combat is a total 180 from the story: It is inventive, fresh, and fun. It puts together a lot of elements rarely seen in RPGs in such a way that it feels unlike any other game I’ve played. For instance, not only do all enemies appear on screen (no random battles here), but enemies who are defeated stay dead. You can return to past areas all you want, roaming empty hallways because enemies seemingly never respawn. The game is balanced well enough that it’s not an issue either; there was never a time where I wished I could level grind. (But then again, there are a couple optional super bosses that I skipped.) And speaking of which, the game has four difficulty settings anyway. I played on the second-hardest setting, but admittedly the challenge was still very low. Another refreshing feature is in the use of items. In most RPGs, you can accumulate a huge wealth of items and never use most of them. In Cosmic Star Heroine, you only ever receive a few items, but they can be used once per every battle. And they have a wide variety of uses too, accommodating many different play styles! Since you can only keep a few items on hand for each battle, it introduces a new element of strategy. Party members too all have distinct play styles in combat. Some of them are especially weird, like a suicidal dancing robot, and require experimentation to understand. All character abilities must be manually set for combat by the player, being limited to eight at any given time. Once abilities are used, they are “consumed” and the character must “Defend” in order to recharge all abilities. After a set number of turns, characters enter a “Hyper” phase where their attack for that turn will do double damage. Thus, combat revolves entirely around maximizing the use of Hypers and selecting the right times to recharge. It is really, genuinely unique! It’s not just another “It wants to be Chrono Trigger,” even though I’ve heard that game inspired this one. If the story could have lived up to its visuals and its soundtrack, it would be a classic. Furthermore, dungeons are never overly long, so they don’t become a chore. And even smaller optional dungeons are everywhere, granting access to additional equipment and items. There’s a lot to enjoy about this game as long as you can tune out how bad the story is. However, one thing I couldn’t tune out is an abundance of small glitches in the game: Sometimes I would get physically stuck and unable to move, soft-locking the game. (A save-quit-load fixes it though.) There were a variety of trivial but pesky menu bugs. And lastly, sometimes screen scrolling during elevator rides would show things that you should not be able to see. In total, these bugs leave a very sloppy impression, making it apparent that an indie team built the game. In an action game or a puzzle game, story really doesn’t matter; I didn’t penalize Axiom Verge for having a story that makes no sense. However, narrative is an important aspect of role-playing games by design. And in that area, Cosmic Star Heroine fails on a major level. The amateurish writing and story cast a dark cloud over the entire game, in spite of its delightful environments, outstanding music, and innovative combat. The ugly cinematics, paired with ugly hand-drawn character portraits, only exacerbate how much of a waste of time the narrative is. I can’t in good conscience give this game a high score when its story is this profoundly lacking. But if the story had been even a little better, my score would easily have raised by at least a point or two.